There are other great sites out there dealing with this art form. 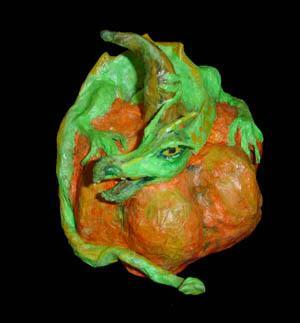 Here are links to some of friends and fellow paper mache artists. One thing you’ll notice as you look around, that there are as many methods as there are artists. I love my techniques because those are the ones I use. My artist friends will undoubtedly say the same about their methods. I also have a couple links to other kinds of artists that I like, and to some groups with whom I associate. Check them out. My friend Lori has a wonderful site. Check out Make Craft Projects. Please look at Seditious, a wonderfully creative blog. Stella is just a great paper mache artist! Here is my friend Carlos’ Facebook page. He is a great paper mache artist! Check out the great paper and cloth mache of James Osterberg! His site, and his blog. For some great Halloween fun, I present Spooky Blue! Creative Paper Mache -A wonder paper mache resource! Galleries, recipes, ideas galore! Check it out! Stolloween Scott Stoll is one of the very best. This is a premier resource! Monique Robert Studios: Amazing Author, Sculptor, Illustrator. Willow’s Gallery – amazing sculpture. Must see! Sue McLearie– Fantastic paper mache animals, bugs, and more! Louie Rochon sculpture-whimsical, wonderful paper mache! Okay, for Halloween, you MUST check out Pumpkinrot! Really cool! Papiermache.co.uk – Galleries, Books, instructions. The works. One of the first, and best paper mache sites!